A new test developed by Canadian and Korean scientists and physicians can tell which patients with acute myeloid leukemia (AML) are at risk of relapse – as early as three weeks after they receive treatment. “In AML, it is very important to predict who is going to relapse,” says Dennis Kim, of the Princess Margaret Cancer Centre at the University Health Network (UHN). The associate professor in U of T’s department of medicine was a co-leader of the study. The first DNA-based test of its kind, it is administered to patients after they've received a standard course of treatment for AML: chemotherapy, followed by a bone marrow transplant. The findings, published recently in the journal Blood, could help doctors improve patient outcomes by changing the treatment before cancer has returned in full force. 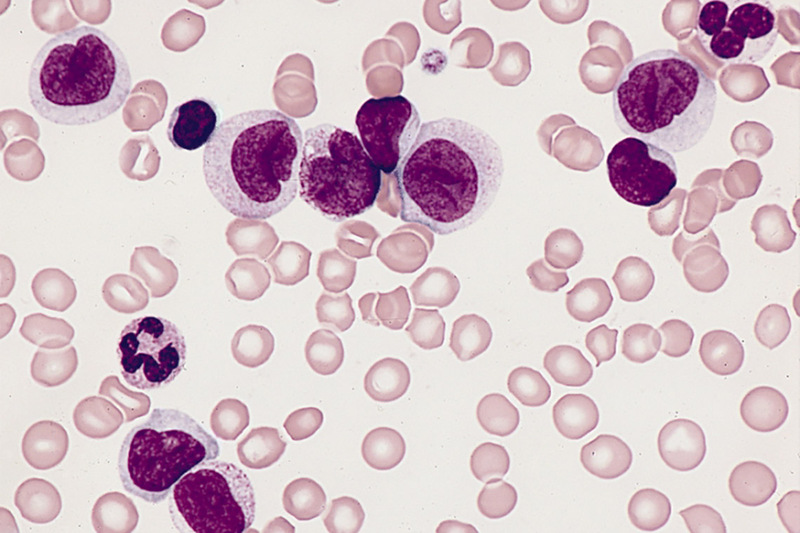 AML is the most common type of leukemia in adults, comprising about one-quarter of all cases. It affects the bone marrow, the spongy tissue inside the bone where all blood cells are made. The disease stems from an overproduction of immature blood cells that over time outgrow normal blood cells. It’s a type of cancer that starts suddenly and progresses quickly, requiring urgent treatment.Treatment involves chemotherapy to wipe out the diseased bone marrow, followed by a bone marrow transplant to reconstitute the patient’s blood with cells from a healthy donor. While most patients go into remission after chemotherapy, about one-third will relapse three to six months after receiving the transplant. Until now, there was no good way to detect the trace amounts of leukemia cells that resisted the treatment and drive relapse. By the time these cells are picked up by available methods, the cancer is usually already at an advanced stage. For the study, the researchers collected 529 bone marrow samples from 104 AML patients who underwent chemotherapy and bone marrow transplants. The samples were collected at different time points: at the time of diagnosis, during the chemotherapy-induced remission, and three weeks after the bone marrow transplant. A subset of patients also gave samples three, six and 12 months after the transplant. Some samples were also taken from bone marrow donors to rule out the possibility that the leukemia cells were introduced by the transplant. The researchers then identified DNA mutations that were present at the time of diagnosis and looked for those same mutations at each sampling point. They found that while chemotherapy and bone marrow transplant eliminated most leukemia cells, leading to a reduction in mutation frequency, some initial mutations could still be detected three weeks after the transplant, indicating the presence of treatment-resistant cancer cells. As these same mutations expand in frequency upon relapse, the data suggest that the same cancerous cells that started the leukemia are also responsible for the disease comeback. “Patients who had a mutation burden greater than 0.2 per cent were four times more likely to relapse than patients who had a lower burden or no mutation burden,” says TaeHyung (Simon) Kim, a computer science graduate student in Zhang’s lab who analyzed the data along with Joon Ho Moon, from Kyungpook National University Hospital in Korea, and Jae-Sook Ahn, from Chonnam National University Hwasun Hospital in Korea, who is part of Zhang’s lab as visiting professor. The research was done as a three-sided collaboration between U of T, UHN and the team led by Hyeoung-Joon Kim, president of the Korean Society of Hematology and a professor in the department of hematology-oncology at the Chonnam National University Hwasun Hospital in the Republic of Korea, who oversaw collection and sequencing of patient samples.